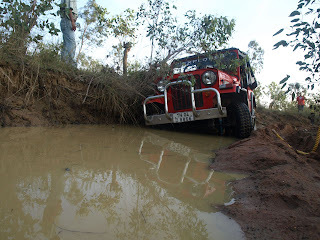 It's been some time now to write about a offroad that the Explorer had, though a week back I was in the Jawadhu and did the complete offroad in reverse, I didn't write about it as the blog is already seen many posts on Jawadhu front. Last weekend We had a small OTR(25 Jan 09), It was in the afternoon which started at about 3 p.m and ended by 8.30 p.m We guys met at sleepy looking hotel in the end of IT corridor a place called hotel Harish in Padur on Old Mahabalipuram Road in Chennai. 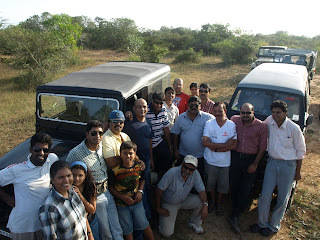 After all of us assembled the convoy of Jeeps headed to Thiruporur the same location chosen for the offroad this weekend, it was a new terrain for me but not for the other Jeepers who were with me. We had couple of Jeeps, Gypsies and Mitsubishi L200 as part of the convoy. After a few kilometers of on road drive, we got into the offroad terrain which splits through a village. We drove through a forest which had lots of eucalyptus trees and bushes. The terrain became wet loose soil one and the 4WD was engaged from there on. 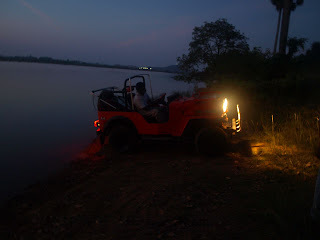 It was quite a tough drive and I was following my friend Vinod who stopped few times to click pictures. He had come with his friend's family hence many more pauses to click pictures ;-). Hmmm I could hear my Explorer wanted me to take him ahead of my friend's jeep and finally it happen to that way. After passing through the water channel and loose mud we got to stop as the there was a canal which is bit deep and too narrow for crossing, so we split into three groups and started searching for other ways to cross the place. This is where the problem happen to me, I was trying to climb a soft and steep mud wall right from the water channel and failed to achieve, hence I wanted move to the other location but got stuck big time. As said here I had to reverse instead took a challenge of crossing the rut perpendicular with a steep mud wall. god stuck royally. 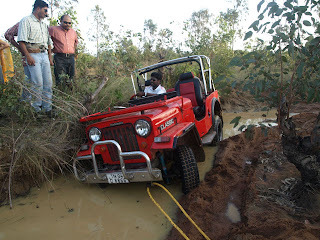 As you can see from the picture below the later maneuvers took the jeep to the edge of the mud wall. bushes made the headway impossible, and the branch of the tree which was on the mud wall damaged my soft top and lost the front parking lights already. I had to roll the windscreen down and remove the top to prevent any further damage. In the process finally with the help of a Gypsy without any additional damaged I came out but couldn't prevent damaging the tail lamps. During the scene we used Manpower to rescue another gypsy which got stuck where no other vehicle could reverse and position itself. 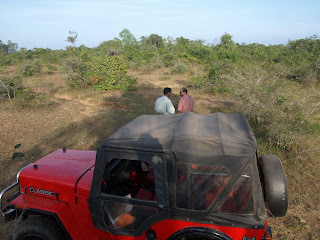 The trail was amazing and it really a feist for our four wheel drive enabled vehicles. After couple of hours of offroad, we were intend to get out of the trail through a lake bund. By the time my turn came it was already bit late evening and the dawn is out of the sky. 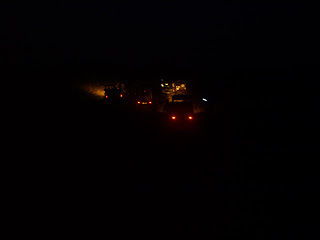 I switched on the head lamps and guys shouted at me to switch it off as to save some power. The Explorer is without doubt one of the best performing Short Wheel Base jeep. I faced least problem in clearing the bund though this activity required some tough maneuvering. The bund lead us to crossing the embankment through fields to the main road. As a whole it was another great Jeeping Weekend, and the week started with restoring the damaged that was caused to my Jeep. By the time when I was writing this blog the jeep is all set ready with new lamp assembly and stitched soft top.